Deep South Dish: BlogHer Food 2010 Arrival Day - I Came. I Saw. I Conquered. BlogHer Food 2010 Arrival Day - I Came. I Saw. I Conquered. My fear that this was my first ever blogging conference of any kind and I would be a complete goof and so out of place I would be a freak. I wasn't. My fear that I was pretty much striking out solo with this soiree with no pre-arranged plans to meet up with any blogger buddies that I had befriended or even halfway, kinda sorta knew. Didn't matter. My fear that I would be in the midst of a bunch of health conscious, super skinny gals who would judge me for being a fluffy, exercise-hatin', southerner who has a blog full of recipes containing butter and bacon and cream. Didn't happen. Not to mention, the fear of being in the company of super-experienced and rockstar bloggers I knew of, like Ree, The Pioneer Woman, Jaden Hair of Steamy Kitchen, Elise Bauer of Simply Recipes, multi-media star Nadia G. of Bitchin' Kitchen - and more rockstars I didn't even know I should know, but who I have apparently have been missing out on - like David Leite of Leite's Culinaria, Shauna Ahern of Gluten Free Girl, and Michael Ruhlman, the swoon-worthy, most handsome blogger on the block, that everybody but me knew about. Turns out, it was easy to be up close with and meet all of those famous bloggers who all seemed to actually be pretty authentic and true to their online personas. Everybody was, well... so normal! And nice. The truth of the matter is, that there was exactly one and only one blogger, a pretty popular, low-fat food blogger, who I felt definitely dissed me, and in fact, walked off in the middle of what I thought was a conversation while we were chatting during one of the break-out tasting sessions. She didn't say excuse me, nice meeting you, nice talking to you, nothing. She just walked off in the middle of a conversation without saying a thing when she spotted someone apparently much more interesting than me across the room. C'est la vie. Tip: If you have social anxiety about being around large groups of strangers, or about your age, looks or weight, please don't let that stop you from going to a blogging conference. I assure you that there were people of all ages, personalities, shapes and sizes at this food blogger event. And, truth is, if you really want to go and stay fairly anonymous, that is certainly possible. So go. The famous bloggers aside, I have to say I met some regular ole food bloggers who were a bit more like me in the blogging world, some familiar to me, some new to me, who, if they were judging me at all, sure didn't show it to my face. People were friendly, warm and welcoming, and chatty - happy to both talk to me about my blog as much as to talk to me about theirs. And most, like me, were also exhausted, so we all related to one another. Travel to the west coast from the eastern side of our country is not an easy trip. It usually is gonna involve not much sleep to trek to the airport at hours no human should be up (unless still partying from the night before), in order to catch a very early flight. I arrived for the conference the afternoon of the day before it officially started and literally hit the ground running and did not stop until I got home. Tip: Be sure to order business cards before the conference. You don't have to spend a fortune on them, and don't worry if you don't have a proper "brand" and logo for your blog, but you'll want to have them since everybody exchanges cards. 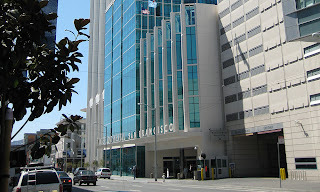 As soon as I arrived at the San Francisco airport, I grabbed a cab - not much under $50 with a tip for that ride - and checked in at the InterContinental Hotel on Howard about 2:30 that afternoon. The room was nice, though not cheap - total for the room and tax for the 3 days was $955 - although if you made your reservations early on you could have gotten a better rate than mine. Tip: If you can afford it, definitely stay at the hotel where the conference is being held. This conference was loud. Excruciatingly loud. The buzz in the rooms during mealtimes, before some of the sessions, and in the hallways at every break out session, was at times overwhelming. Having the ability to break away from the session brain overload and the noise just long enough to go up to your room and refresh for a few minutes between sessions is so worth it. Also, if at all possible, try to give yourself a night and day there before the start of the conference and take it easy on the first night. Relax and take in a casual dinner, or even room service. You'll have time to acclimate yourself to the whole time change thing and wake up the next morning feeling refreshed, with a day to experience the city at your leisure before the work begins. 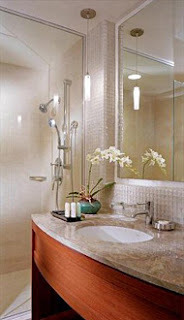 Cool bathroom, huh? While there were ice machines on the guest floors, there were zero vending machines anywhere, so your option for drinks and snacks were limited to the in-room bar, and you know what the costs are for that - things like $4 for a 6-ounce bottle of Diet Coke or a $12 can of nuts can add up quick. To see what the room looked like, you can visit Pioneer Woman's hotel room tour, because I had the same exact room, minus the separate sitting area. Turns out, I was actually in the bedroom half of a suite anyway, minus the key for the sitting area and the "big" door. Guess I shoulda asked for an upgrade, huh?! Once I got checked in, I had just enough time to get settled in the room, check in at home, take a quick shower to freshen up and change, and meet up in the lobby at 4:30 with the driver for Beringer who was picking me up, along with three other bloggers (none of whom I knew), for a Beringer Happy Hour event. Tip: If you are preparing to head out for a conference, and you happen to be on Twitter, find out and include the Twitter hashtag for that conference, and use it when tweeting with others about the conference. Public relations companies follow those threads, and then check out your blog, and that is how you will receive invitations to parties and special events. By the way, my Canon died on me right before it was time to leave for the conference, so while I brought a point and shoot and my iPhone to the conference, I didn't manage to get a lot of pictures and the ones I did get were not very good ones. Throughout 2010, the Deen Brothers participated with Beringer, in holding regional cooking contests across the country to pair up Beringer wines with the best steak recipes for the Beringer Great Steak Challenge finale. Each regional winner was participating in the final grill-off to be held at the Beringer Vineyards and this event I attended was the Happy Hour kick-off to that finale, hosted by Bobby and Jamie Deen. The grand finale cook-off is scheduled to be aired on The Cooking Channel sometime in December. The event was held at Cellar 360, a gorgeous facility located in the Woolen Mill Building in Ghirardelli Square (yes, as in the chocolate) overlooking San Francisco Bay. That shot was the view out of one of the windows. Cellar 360 is a wine lovers dream, featuring over 200 wines from the best wine regions of four continents. There were plenty of great wines to sample, and tastes of some of the specialty foods they sold, plus Bobby and Jamie were going to cook for us! The Deen Brothers were so kind and accessible you would never think of them as being the celebrities they are, and yes, they are as good lookin' in person as you think they are, but let me tell you - Mama the Queen Paula Deen has every reason to be so proud of her sons. Being a southerner and a southern mama, I can tell you, they were the epitome of true southern gentlemen. They were even kind enough to give each of us a free, autographed copy of their latest cookbook - Take it Easy - a collection of 125 southern style, quick and easy recipes - that they also so graciously personalized for each of us! Since it was such an intimate affair, they were even willing to take pictures with us. Even if some of them were shaky and blurry iPhone pictures taken with your eyes closed (though the gal taking it said it was "a good one"). It was a fun event, that culminated in the kitchen of Cellar 360 (where else!) where Bobby and Jamie chatted with the audience and made us laugh - who knew they were comedians too - after which they prepared Butter Braised Shrimp, a recipe from their cookbook, and one of their Beringer challenge recipes, this spicy mocha steak rub recipe below. For the demonstration they prepared the rub with flank steak and we were able to sample it. Try it - it really was delicious! Though there was plenty of wine to be had, I was so tired that I had exactly one small glass the entire event. The rest of the bloggers I rode over with decided to wander around in search of some place to eat, but I passed. To be honest, all I could think about was getting back to the hotel, where I could kick off my shoes, shower, throw on some jammies, order room service (shrimp cocktail and a Cobb salad), and watch a few minutes of Grey's Anatomy, before collapsing in that comfortable bed. It would be an early start to the conference the next morning after all. I wish I could tell you the names of the other three bloggers, but frankly we met for the first time in the hotel lobby, rode over to the event together and that was pretty much the extent of our association. I'm sure they don't remember me from Adam. See? I told you, it's easy to remain anonymous... if you really want to. Stay tuned for Conference Days 1 and 2 if yer interested. In the meantime, check out this rub - it was mighty good y'all. Enjoy! Combine the brown sugar, chili powder, espresso, oil, salt and cocoa powder in a small bowl. Rub all over both sides of the steak. Preheat a grill to medium high. Grease the grill rack and cook the steak to desired doneness, about 5 minutes per side for medium rare. Transfer to a cutting board and let rest for about 5 minutes before slicing. Special thanks to Michelle Flores of Ruder Finn/West for the invite. You did a great job covering the BlogHer Food 2010. 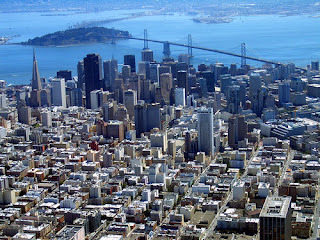 How fun to meet new people and see a bit of San Francisco. Deep South Dish is a great food blog and you do a wonderful job sharing recipes. The Pioneer Woman is the only one of those I'd heard of - I thought you were a famous blogger :-). Looks like a great wine tasting event. Tip - everyone is just regular folks some just get the big head and think they aren't - don't be intimidated by anyone. I'm not a big city person, but as they go, S.F. is a pretty good one - Bev loves to go there. I've only heard of two of the "famous" bloggers. What a great accounting of the event. Thanks for taking the time to write it up. What a fun event with the Deen Bros. Too bad Queen Deen wasn't there. I'm a big Paula Fan. C'est la vie, indeed! Or as I have learned in Spanish, Asi es la vida. I would love to attend a BlogHer event. Thanks for sharing. Awesome post! I love going to conferences, but I've never done any of the BlogHers. One of these days... You have a fantastic blog and I'd hang out with you at BlogHer ANYTIME, but that low-fat blogger? Meh. I'll take fun and polite over skinny and rude any day. Oh, can't wait to hear the rest of your tale. It was so nice talking to you on the bus to the big party. Oh, you should have written about the lady at the Jimmy and Bobby Dean, that was so entertaining. Hi Wild Magnolia! Thanks so much, and thanks for being a reader. I'll have some more relevant info coming up - this was just a roundup of my arrival the day before the actual conference, so stay tuned! Larry you are so sweet - I am nowhere near famous LOL! I do agree with you but I guess it's just a natural tendency to be nervous around strangers, especially when they do something like you do. I guess you worry whether you'll "measure up." It was a nice city that I didn't get to see much of. Would love to go back for a vacation though! Hi highlandsranchfoodie, thanks! It would have been so cool to have met Miss Paula, but I cannot even imagine the crowd that would've been there for that! I enjoyed meeting Bobby and Jamie though. Laurie, check back for the other updates if you're interested in learning more about the conference itself. Jelli, I have attended other work related conferences in the past - this food blog confererence was the best by far! Linda, you are a doll! Stephanie, I so enjoyed meeting you. You are in my next post actually. :) I started to write about the crazy lady who wanted Paula Deen to come cook at her alien ship, I mean elevated round house (was it? ), but figured this post was already getting long enough LOL! She was a hoot though. I still wonder who she was media-wise. I just am not able to get online much anymore (boy, has my own blog suffered!) so only have time to check in (& not very often) on my top favorite blogs. And that's YOU Mary!!! I love your chicken recipes. I have made your chicken on the grill & the rootbeer bbq sauce glazed drumsticks too. I look forward to reading about the rest of your conference. I'm so glad you got to go & it sounds like it was a great time! I was so glad that I had business cards made for my blog before the Eggtoberfest because they definitely came in handy when dealing with the vendors. Great post. Sounds like you had a wonderful time. You have a great food blog, even though I don't visit and comment on it as much as I would like to. Have tried several of your recipes and they were wonderful. Thanks for the great recap, you did a great job, can't wait to hear more from the upcoming days! enjoy! Thank you for sharing. I have to tell you though, I'm pretty sure your famous;) Yup, I'm a long ways from you and I've never commented before, but I read your blog faithfully and some of your recipes are to die for! OMG! I guess I am the only one that clicked on your links and found a BAD one! The link for Bitchin' Kitchen is not for Nadia's website--you will definitely want to change it or eliminate it. LOL! I love your blog and the conference sounds like it was so much fun. Especially the Deen boys. Glad you blogged about it--makes me feel like I was "almost" there! Thanks! Jane do try to make one if you ever get the chance! Jane, I'm nowhere near being famous and that's perfectly okay with me LOL! But I'm glad I'm one of the few you have time to spend time with. I'm so glad you're liking the chicken posts - I think we probably eat more chicken and shrimp than anything around this house. Probably because chicken is cheap and my husband shrimps so that's free!! Blogs do take time and real life tends to take over - my other little general interest blog suffers, so I totally understand that for sure! You're so right Chris - they don't have to be super fancy, mine was real simple. Basic info and a pic of fried chicken LOL!! Thanks so much Thena! It was fun, but I swear I am still recovering!! Thanks Anne - hope I have some interesting things to share. Oh Bonnie, thanks so much! I've been meaning to check the links all day but kept forgetting. I fixed it. Hope you enjoy the other conference posts too!! Great post! I would feel the same way. It is good to know I wouldn't be the only one. 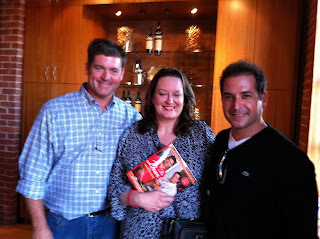 I am jealous you met the Deen Boys - I love their cookbook!! I also love San Francisco. I'm glad you enjoyed your blog conference. I went to Bloggy Boot Camp In Philadelphia last month and enjoyed it, too. San Francisco sounds a lot more exciting though! You have a GREAT blog and are famous to your readers. Sounds like you had a great time. Can't wait to hear more about the trip. Pat yourself on the back for conquering your fears! What a great recap of you Blogher Food! I so wanted to go to this but just couldn't make the trek across country. I'll be looking forward to reading about days 1 and 2! Awesome post with excellent tips! So glad that you had a good time. Thanks for describing your adventure. One of these days I will make it to a conference. I need to start saving up! You are so cute Mary... I totally remember you!! Love your re-cap, and your honesty! I think you're a famous blogger!! I bet there were tons of bloggers in awe of YOU! I envy you your trip--what a great job you did of writing it up. oh....I took a Cajun cooking class last week. IT WAS SO MUCH FUN. And the food tasted good too. hello!This was a really brilliant blog!